Children spend more time within the walls of their school than anywhere else but their own homes. How much time are we talking about? With so much time spent inside institutions, one has to wonder, how these spaces affect our children. The answer, it turns out, is that they affect them tremendously. The physical designs of schools impact upon our children's ability to learn and, moreover, to thrive. All this is to say, the better the classroom design, the better the learning outcome. This is empowering information and an amazing opportunity for you, as architects, to design spaces that have a marked and positive impact on students. With an expected boom in construction and renovation of schools in the UK, and Europe as a whole, architects will have the chance to help reshape and redefine future learning environments. How Do We Design Better Schools and Classrooms? Do you have a School Design or Renovation Project We Can Help With? As an architect designing for education, you should take into account six key design considerations linked to increased academic performance and well-being in children. It may seem like a daunting task, a first, to consider and correctly address all these considerations, but this guide will walk you through each design consideration and show you how to create the biggest impact. Best of all, we’ll show you how including modular skylights in your design can help you address the majority of these considerations head on. If it seems like these considerations are important for many projects, not just designing better schools or classrooms, that’s because they are. The lessons gleaned from this guide need not be restricted to school design or renovation alone, you can use them in all the work you do, from healthcare facilities to better work spaces and even better living spaces. The benefits of daylight are widespread. Everyone can relate to the effect that daylight can have on your mood, energy level, etc. and research certainly points to this being true for children and their ability to learn. Daylight had the largest individual impact of all the design considerations the Head Project pointed toward. Good daylight, the research found, brings about physical and mental comfort, meaning the effects of daylight extend past simply aiding sight. The idea of designing for daylight is finding ways to channel the most daylight, making it your primary source of lighting. You will also need supplementary, artificial lighting for darker days, particularly in the grey winter months. For the most part, though, you should use natural light as often as possible. The amount of light in schools and classrooms, of course, is not purely a matter of preference or comfort. There are certain daylight building codes and standards, such as the European Standard, EN 12464-1: Light and lighting — Lighting of workplaces — Part 1: Indoor work places, which provides information on the indoor light levels applicable for school environments. As daylight performance depends largely on availability and properties of daylight at the buildings location, however, we believe daylight evaluations should account for ‘daylight factor targets’ based on outdoor illuminance levels, gleaned from historical climate data. Generally speaking, we recommend levels of minimum 300 lux - by meeting a target climate based daylight factor - for most of the room area and 500 lux for areas where productive work is performed. We believe that the amount of daylight a design allows for should not just be a consideration applied to new constructions. Renovation projects, too, should create strategies for actively improving daylight conditions. To best figure out the amount of daylight you can expect in your next project and how to improve upon that number, read our article on daylight calculations and measurements and check out our daylight visualisation tool. When designing for daylight, a major challenge lies in getting an optimal and even level of brightness over the entire classroom and preventing glare. This challenge is particularly evident in deep classrooms, where there is a great distance between the window and the back of the room. In such spaces, students seated near the window will be oversaturated with light, whereas students seated further from it, will get almost no natural light at all. The direction a window is facing will impact the distribution of light and amount of glare. North facing windows, for example, can bring about a more even distribution of light throughout the day and year, thereby, generating less glare. An additional approach to glare reduction can be found with your sunscreening solution. For example, using blinds, external shading, or even certain glazing varieties can help reduce glare. The degree of reduction your sunscreening solution will provide depends on a number of factors: optical properties of the material (blinds or external shading), orientation of the window, annual sunshine hours, glazing area and transmittance of the pane and the distance of the user from the light source. It is important to remember that while sunscreening with blinds or external shading can be an extremely effective approach for reducing glare, it can have an adverse effect if done at the expense of the view to the outside.5 For this reason, automatic solutions, which naturally adjust to sunlight levels are beneficial. A final way glare reduction can be achieved is through decreasing the light contrast, or, the difference between absolute brightness and relative brightness. Just as a beam of light would look brighter in a pitch black tunnel, light in a room will cause the appearance of glare if the rest of the room is dark. It is therefore advisable to increase the overall level of light in the room. Skylights very often provide a good solution for achieving even lighting and preventing glare within a classroom. This is particularly true in classrooms where the shape or size of the space does not allow for even light distribution, or where there is simply limited window space, preventing enough light to enter in the first place. There are a number of factors, which contribute to the amount of light a window or skylight can bring into a room: glazing transmittance, wall thickness, external obstructions, extensions above (e.g. overhangs, balconies) and to the sides (e.g. extension of the building itself), depth of the room, etc. With all things considered, though, a skylight provides more than twice the amount of daylight as a facade window of equal size does. 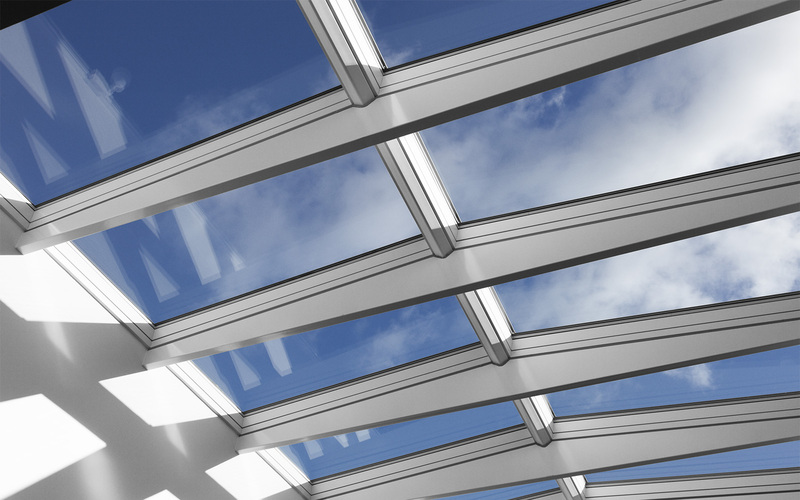 In multi-story buildings, skylights might not readily come to mind as an optimal solution, but in such cases, light shafts or sun tunnels can be an effective alternative. Overall, our advice is to vary your window types. Couple high quality Modular Skylights with facade windows to achieve great light throughout the classroom. Such an approach would also reduce contrast and glare. 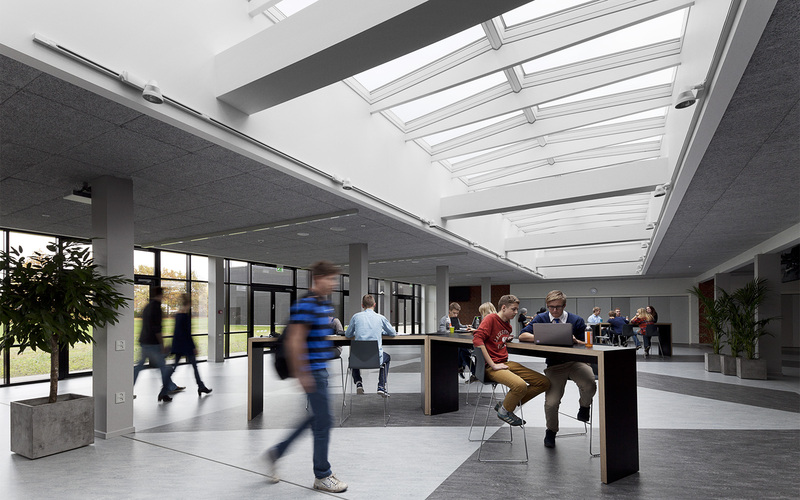 Check out our article “Rebuilding a school’s character with plenty of daylight,” to see how the vocational school, Sågbäcksgymnasiet, uses VELUX Modular Skylightsto illuminate the 1961 interior, leading to a marked surge in student activity. Ensure that daylight is the main source of light for most of the day-lit hours during the year. Select solar shading that allows for daylight quality without obstructing the view. Combine facade windows and skylight windows for best results. Invest in daylight solutions where the students are – allow for slightly darker areas elsewhere if needed. Providing high indoor air quality is imperative in the design of schools. Better air quality is linked to better learning outcomes and better overall health. Poor indoor air quality will not only make for an environment that is difficult to concentrate and thrive in, but can lead to an increase in illness and school absenteeism. According to the US Environmental Protection Agency (EPA), indoor levels of pollutants may be two to five times higher than outdoor levels. Since children breath in more air – in proportion to their body size – than adults, they are all the more susceptible to these pollutants. To make matter worse, the EPA indicates that almost one in 13 children of school age already suffer from asthma, which would only be exacerbated by such pollutants.8 It is, therefore, imperative to address classroom air quality and the main way that this can be done is through proper ventilation. It is critical, then, that the establishments that shelter our children must be adequately ventilated, particularly within densely populated classrooms. Achieving better air quality is as simple as ensuring better ventilation. Windows with large openings that allow for air to escape can provide a great natural ventilation solution. This is particularly true of top-opening windows, as they allow the hottest and stalest air to escape. Bear in mind, though, children are particularly sensitive to thermal change, which is inevitable when using natural ventilation. During colder times of year, you will want to consider venting when students are out of the room, or consider using mechanical ventilation during these months. Mechanical ventilation, or the use of electric fans to direct airflow into a building, can be a solution where natural ventilation is not sufficient. In the design of schools, it is often beneficial to use a hybrid solution, combining natural and mechanical ventilation. The larger the volume of space in a classroom, the longer the air supply in that space can be considered good quality. Generally speaking, classrooms consist of a large volume of students packed into a relatively small space. This means that air quality can become poor in as little as 30 minutes. It is important that you take the volume of a space into consideration when planning your ventilation solution. To find out more and get useful advice, read our guide about how building type can affect ventilation. CO² levels are often looked to as an indicator for the quality of air. Outdoor air, as an example, contains a CO² concentration of approximately 400 ppm, whereas an indoor CO² level of 1150 ppm can be considered adequate air quality. The range you will want to consider is from 1400 ppm, which will ensure good indoor air quality in most situations, to 1600 ppm, which indicates poor air quality. Using CO² sensors is a good way to monitor levels and ensure CO² levels remain within the lower end of this range. A really attractive choice for ensuring high air quality in your school design is through VELUX Modular Skylight venting modules. The modular skylight venting modules are equipped with hidden chain actuators that allow them to automatically open and close, either by command or in response to pre programmed conditions. When closed, they look exactly the same as regular fixed modules. 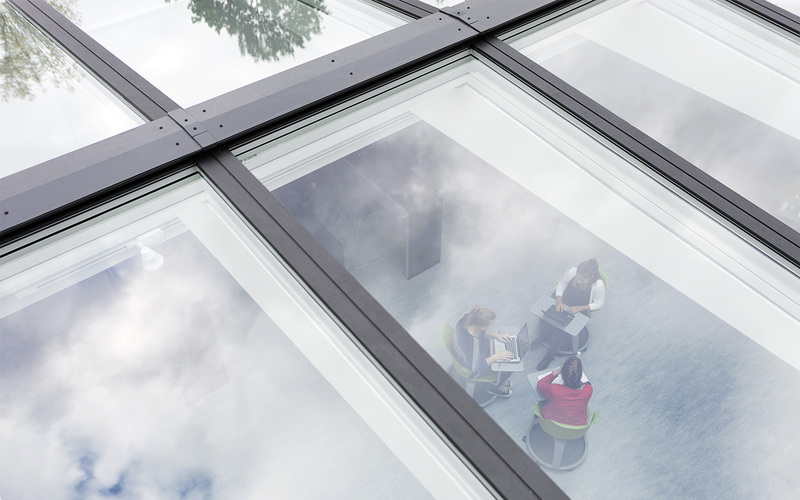 With VELUX Modular Skylight venting modules, it is even possible to link your windows to CO² sensors, allowing them to open automatically to regulate levels. See how Ryparken Lille Skole in Copenhagen, Denmark did just that. They used VELUX Modular Skylights to turn a run-down textile factory into a lively school. Use our tools and evaluation methods to evaluate your future ventilation solution and find out ways you can improve upon it. Open windows and air out classrooms between lessons. Innovative natural ventilation solutions, e.g. demand controlled natural ventilation, can maintain the CO2 level within the recommended range. Mechanical ventilation systems can ensure an optimum level of air quality without compromising thermal comfort in colder months. Hybrid solutions can combine the advantages of both natural and mechanical ventilation. There are a number of health benefits, as well as implications for productivity and learning, associated with achieving a comfortable temperature - or thermal climate - within a space. Zeiler and Boxem (2009),12 Mendell and Heath (2005)13 and Fisk (2017)14 found that when temperature and humidity increase, student levels of achievement and task performance fall. This is thought to be a result of decreasing attention spans and increased discomfort. High classroom temperatures, they found, can also be linked to headaches, as well as eye, ear, nose and throat symptoms. Further, high humidity levels lead to increased incidences of mould, which can exacerbate the above mentioned ailments. The temperature, or thermal condition, of a space greatly relates to both the daylight and ventilation in that space. Thinking of these elements as connected will not only lead to more pleasing environments, but will also bring about greater efficiencies. That is, having a solution that allows for maximum daylight will increase warmth and decrease demands on heating. Similarly, having a system that allows for natural ventilation and makes use of solar shading assures that a building stays cool enough, reducing and sometimes all together negating the need for cooling. Ventilation during the day removes excess heat from the building by creating high air movements through natural ventilation. Night ventilation (also referred to as night cooling) will cool down a building's thermal mass at night by using cool outdoor air. Solar shading, in addition to blocking sun and reducing temperature in the summer months, can be used to insulate a window in the winter months, reducing the demands on heating. VELUX Modular Skylights offer the perfect solution for natural thermal control with their automatic venting modules and modular skylight blinds. Since there is no one temperature that defines thermal comfort, the best approach is an adaptable solution, where venting and shading can be controlled at will. Most importantly, though, an ideal thermal solution is one where building occupants can remain connected to the outside environment and are shielded from outdoor conditions only when necessary. Exclusive use of natural thermal regulation is, of course, not always possible. When necessary, fans and electric air conditioning should be used to combat excessive heat. To tackle the cold, The Clever Classrooms report (2015) found radiators to be the most effective. To understand, or improve upon the thermal conditions of your next project Use our climate visualiser and our guide on evaluation methods. Use solar shading and natural ventilation in summer to prevent high indoor temperatures. complement the systematic use of natural ventilation with energy-efficient mechanical ventilation for an energy neutral strategy for cooling. Design with windows in the façade and the roof to allow good air flow across the space (e.g. cross ventilation, stack effect). Integrate successful solar shading solutions in the school design by interrelating air quality, air temperature, view and daylight in an iterative approach. Two studies by Crandell and Smaldino (2000)16 and Picard and Bradley (2001)17 summarised the findings of several other previous studies and concluded that the acoustic environment of a classroom is a major influencer of both academic and psychosocial achievement of children. Designing for acoustics in classrooms means designing environments that can facilitate productive classroom communication. While there are certain acoustic requirements in building codes that you should be aware of, generally speaking, an effective acoustic design should help students best hear their teachers and one another, while keeping out distracting background noise. We can break unwanted noise into two categories: external noise and internal noise. Situate classrooms away from busy areas of the school. Use corridors, storage closets and restrooms as sound buffers. Place schools away from busy roads. If this is not possible, then at least keep classrooms away from, or buffered from the noise. Use false ceilings with acoustic tiles. Use Tables and chairs with rubber feet. Incorporate acoustic panels if necessary. Remember that porous materials can be used to absorb sound, while curtains can improve the acoustics by dampening echoes and reverberation. Create a classroom layout in which students are in close proximity to the teacher. A major challenge to ensuring attractive acoustic properties is ensuring that you don't lose out on daylight or ventilation in pursuit of them. VELUX Modular Skylights can help with this. Venting modules can stay closed during class time, keeping out unwanted, external sound, all the while letting great light in. During breaks from class, modules can open to let in fresh air. Windows with a pane construction of 2 layers with different glass thickness (e.g. 4mm and 6 mm) will achieve a better sound insulation than a window with a standard glazing unit. 3-layer glass units with different distances between glass, and glass thickness, also perform better than the standard solution. Using a different gas filling will also have an effect – krypton gives better sound insulation. laminations are another way to achieve greater sound insulation of the glazing unit. To evaluate your acoustic solution, use our acoustic evaluation and measurements guide. But how do we create classrooms that promote promote ownership and flexibility? Room designs that are distinct, yet instantly familiar to children. Making room for display of children’s artwork. Personalised, name-plated storage spaces - such as lockers, drawers or coat pegs. Child-centred learning spaces with well-designed and age/ size appropriate furniture to suit. Classrooms with clearly defined breakout zones or breakout room. Rooms with varied floor plans work best for the youngest. For older pupils, squarer and larger rooms are preferred. Place storage, such as cupboards and coat pegs, within extra-width corridors to save classroom space for activities. Make sure large, accessible wall areas are available to provide opportunity for display of information and students’ work. For Younger children, create different learning zones with clear paths between the various zones. You can read more about the effects of ownership and flexibility on student performance and learn more about how you can design for it in our blog post on the subject. Under or over-stimulation is an often spoken of point of concern with regard to children. We are very often trying to discern how we can engage children without overloading them with stimuli. The good news is, there is a bit of a science to it. When it comes to classroom design and decor, according to the Clever Classrooms report (2015), the effect is curvilinear. This means that the key to designing stimulating classrooms is finding a happy medium between too much and too little. Placing display materials on windows should be avoided due to loss of light. With regard to colour choice, the report suggests the use of mid-levels for overall wall colour. To get splashes of colour, accent with brightness on the floor, blinds, desks or chairs. Finally, we recommend you tie it all together by giving students a view to the outdoors with VELUX Modular Skylights. If you’re interested in learning more about how VELUX Modular Skylights can help you build better schools and buildings in general, or you have questions about a specific project, please reach out. We’d love to hear from you!